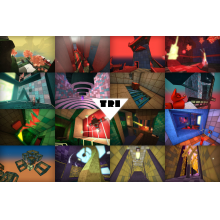 TRI is a first person puzzle/platformer from indie developer Rat King Entertainment, due out on October 9th for PC, Mac, and Linux. The game has been in development for several years now and is a full title based upon a concept that the two person team at Rat King produced for Ludum Dare 20 game making competition. Originally available for purchase in various alpha and beta states, the final build is now getting close to release on Steam and Rising Star Games has stepped in to assist with publishing. I had the chance to play a beta build of TRI in advance of its release, and it is definitely shaping up to be the kind of title fans of first person puzzle games are going to want to buy as soon as it’s available. You may have been able to guess this from the title, but TRI tasks the player with creating magical triangles to traverse across the world and navigate paths that would otherwise be unreachable. There is a bit of a storyline to the game, as you are sent into the world of the Odd Gods and attempt to collect three fox totems in each level to try and catch up with the elusive Fox God. TRI presents the idea that foxes are mystical creatures, and what I’ve played so far has a fantasy feel that gave off an Eastern spiritual vibe. As with most puzzle games, the story isn’t the primary focus though and a lot of elements are left for the player to try and figure out themselves. There are cutscenes, but they don’t appear in between every level and feel well spaced, letting the emphasis remain on the gameplay mechanics. In each level players are tasked with collecting the three fox totems and placing them on a pedestal in order to open a portal. Along the way there are also a number of optional gold statues the players can collect, often in more obscure or out of the way places. In the beta the first time I grabbed one of these I was told that their functionality hasn’t been fully implemented yet, so it’s unclear what they will grant the player and whether a secret ending or level might be tied to collecting all of them. Environments start off fairly small and self-contained, and the first level allows you to get used to navigating and performing some basic platforming. TRI has a different sense of physics than some games, as you can hold the spacebar to extend your jump and your character can jump a bit higher than in other titles in this genre. You can also sprint for a short period of time, and crouch under obstacles. A strange figure that looks like the ghost of a monk can be seen in each level, and he tells you about the legend of the foxes while also providing some hints for how to solve the puzzles. After solving some basic jumping and switch puzzles, you gain the ability to create magical triangles. The mechanics are easy to pick up, as you draw a line and then create a triangle off of that. You are limited by the angle you start to draw it at, and triangles will either turn yellow or red to indicate if you can walk on it. If the angle is too steep, it will be red and you will be unable to use it. It’s also possible to stack them on top of each other and create structures to progress, and if you mess up you can easily delete a single triangle by right clicking, provided it isn’t acting as support beam of some kind. Earlier levels present players with gaps that are too wide to be crossed by normal platforming, and triangle creation is the key to progression. I was worried that the levels might all end up as simple variations on this concept, but was happy to find that not only did the size of the environments increase significantly as I moved forward but the complexity of the puzzles did as well. I tend to find a lot of puzzle and adventure games to be hit or miss depending on how natural their mechanics are. Too often puzzle titles can be frustrating because their solutions are completely nonsensical or they add extra challenge by imposing arbitrary limitations on the player. This is why TRI was so exciting, as it’s the type of game where just as you start to master a particular concept another is introduced. Soon after you make triangles to use as platforms, you’re given the ability to walk on walls. Triangles are used as a springboard, and if they’re around the same general size and facing in a similar direction red ones will turn to yellow as you walk up a surface. This opens up the levels considerably, and also brings dizzying landscapes into focus. Walls become your new floor, and much like Portal there’s an emphasis on re-orienting yourself to figure out which way you need to go in order to ultimately move forward. Currently I’m a decent way through the seventh level, and the title screen tells me there are sixteen in total. Gameplay videos I’ve seen on Rat King’s channel suggest some additional mechanics based around the reflection of light that I haven’t gotten to yet, so it looks like the puzzles will continue to add new elements and the environments will get even more abstract and larger to keep things fresh. What also impressed me about TRI was the very relaxed feel of the game as a whole. I’m the type of person that can get frustrated easily when a solution is not clear, but I never felt this throughout my time with the beta. Levels often have an open ended feel, and there’s a sense of wonder in figuring out how to effectively explore the environments to collect the items you need to progress. There is no limitation to the amount of triangles you can create (though the game does tell you how many you used and how long it took you to finish the level), so you’re free to experiment and learn the mechanics at your own pace. I knew the game had taken hold of me when I was at work running through possible solutions in my head to try out when I got home that evening, and it has been a little while since a puzzle game has had that effect on me. The build I was given may be a beta, but it’s clear that the game is very close to a final release. I experienced no glitches or game breaking moments, and the framerate stayed consistent even when the camera was rotating in multiple directions as I moved from one wall to the next. The overall look and feel of TRI is another element that sets it apart, as the environments I have played through have a bit of an Eastern look and I got the impression that they took influence from some different real life temples. It’s a very visually appealing title, and part of the fun in solving the puzzles is discovering just what type of environment you will be able to traverse next. It’s impressive that this is just from a two-person team, as the sophisticated architecture and consistency of the art style is comparable to games from larger developers. TRI’s music functions in a similar manner as its graphical style, as the background music is all fairly laid back and puts the player in a relaxed mood and allows them to focus on the puzzles rather than be distracted by the songs. I did notice a few occasions where the music seemed to disappear and then suddenly reappear, and I’m not 100% sure if there was some sort of glitch that made the music stop or if certain parts of the levels were designed to be completely silent. Aside from the music, there are sound effects associated with creating and destroying triangles as well as when manipulating objects in the environment as well as the voice of the mysterious figure guiding you through each level. Rat King seems to have gone for a fairly minimalist and non-intrusive approach to sound, and for a game that’s focused on letting the player stop and think about how to solve each obstacle in front of them that’s definitely a plus. I’m a little less than halfway through TRI at this point, and it’s taken me four hours to get there. Levels have gotten more complex and taken longer to get through, but all of the challenges I’ve been presented with so far have felt fair and it has been enjoyable to figure out the best way to overcome all of the different obstacles. Anyone that’s interested in the puzzle/platformer genre will want to give TRI a look when it comes out next month, as it takes a simple concept and adds layers of complexity to it to ensure that each level feels different from the last. When you combine that with the visually pleasing aesthetic there’s a lot to like, and it’s clear the years Rat King has had to fine tune their gameplay ideas is paying off. I’ll have more in-depth thoughts on the various game mechanics as well as some additional details once the final build is available and I’ve had the opportunity to see more of the in-game content, so look for a review in a few weeks.